It was a spurn of the moment thingy. 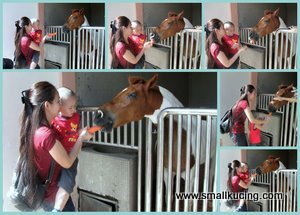 Mamarazzi was chatting with Auntie Little Bird then some how this horse riding thingy came up. Then Mamarazzi had an idea. 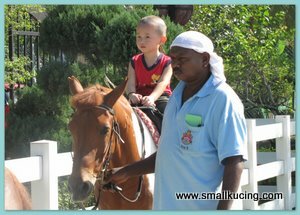 Let's go horse riding at Titiwangsa and maybe picnic later. Kebetulan Auntie Chee Yee came online. Roped her in. Yeehar!!!. We arrived Taman Tasik Titiwangsa around 8.30am. Wow..many people there doing morning exercise. Finally found a parking lot. No parking near the stables. 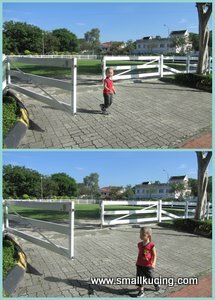 Had to walk quite a bit to the stables but since it's still early it was not that hot. Looks like I am on the correct path. Saw some carriages being washed and clean. Horses just "woke up" . Some are being bath and groomed. Wah Lau Eh...so early so many "paparazzi" already? Ooo...getting ready to "start work" ah? 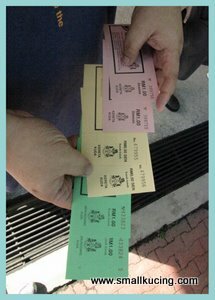 Papa bought some tickets for us. Bye bye...off we go. First round, the horse must have had V-Power Hay coz it went very fast. Didn't get to enjoy much of the ride before it ended. The second round was better. The horse was on a slower pace. The Indian Uncle offer me to sit next to him and hold the rein but I was rather scared. I want to sit with Mamarazzi. I saw Auntie Little Bird drove a carriage. Fuiyo!....must run far far away. Scary man! If she was a male in the old days, surely she was a Cowboy. Ganas! I rather roam around instead of carriage riding la. 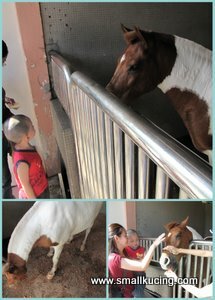 Then Auntie Little Bird brought us to feed the horses. She brought along some carrots. The people there know her. Hence they don't mind us feeding the horses. Patches oh Patches(real name Meranti)...are you full full already? Can I have a ride on you back? Me riding alone ah? Rather scary at first. This is the 1st round. By the second round, I was no longer afraid. I can even send a "Senyum Kambing" to Papa who is holding the camera. This is fun. how's the feeling riding on horse? 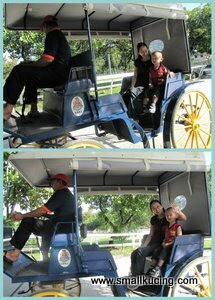 Joshua so brave and clever, me so old liao still never ride any horsie yet, tsk tsk! Been almost 10 years plus i never go there, now even got horse riding! Oh yes, my boy is much better now(can play and run around liao)! Still purging but no as serious as before, doc said it probably takes a week or so for him to fully recover! Thanks for your concern, appreciate it! How's Joshua, hope his cough getting bettr now, keep well and take care ya! Wah...7 early, 8 early...your mama already teaching you horse-riding! Muahahahahaha!!!! wow, my girl would love it! Thanks so much for all the wonderful comments on my blog!!! I love them!!!! Syiok!! Dun think i can wake up that early...lol!! 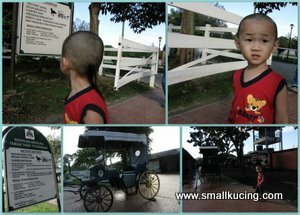 **used to stay at KL, and i went there once only...hehehhe..but didnt go for the horse riding. if you come down KL do take time to go there. A lot of things there. Fun, eh? Wah, you had the privilege to feed the horses tim. Did he ask to go again? Chloe has been pestering us to go again... but that place is so far away from our place, malas lah haha. good that you enjoy yourself.. nice..
Can't stop admiring your son on the horse, you looks so cute. Tasik Titiwangsa, been there once many many years ago! Looks like it had change a lot. Is that Cleff in the picture carry small kucing feed the horse? Aiya..should put bigger picture of her la, so small. AIYE...i never been on a horse.. scary for auntie here too! LOL...wait till the kids recovers 1st. Maybe school hols? Was scared at 1st but later got used to it. If Sunday evening will it be too tiring for the kids? See if can arrange during school hols it will be great. but come to think of it, so fast!!! i don wanna end so soon... i still wanna holiday!!! !